This is our third summer in this house and I'm finally starting to get some inkling of an idea of what to do with the garden. Today we dug up some of that unreasonable raspberry patch and replaced it with a blueberry plant that Blake bought on impulse this weekend. we should probably mulch it, but we don't have any mulch. I also moved a few of the ostrich ferns which had been stranded between the fence and the deck when we built the deck. They were on either side of the pathway you see on the bottom right there, and they were in danger of being trampled. So I dug a nice new bed on the opposite side of the garden, by the fence about halfway back, and moved five of the ferns over there. I'm going to get some huechera to go in between and it should be quite charming. I love ostrich ferns—I told Blake I would be happy if our garden was, like, forty percent ferns. They even smell good. We spent a lot of time cleaning out the hedge in the front yard. I don't really want that hedge but I haven't come up with anything better to do there so we're keeping it for now, but it's a mess. Lots of different things growing in it, to the extent that I had to arbitrarily decided which species was the "real" hedge and then yank out anything that wasn't that, including a truly irritating number of maple treelets. I'm not sure what the hedge is made up of, but I've noticed a few hedges of it in the neighbourhood so it must be something pretty standard. While I was checking out other people's hedges I noticed more than a few which were lousy with maple. One was mainly maple. The last big accomplishment today was moving the composter from the neighbour's yard to ours. They are shiny urban hipsters and composting isn't really their thing—the composter was left by the previous owner—so they said we could have it. We tucked it just behind the new fern bed, not too far from the house that we won't use it, but not too close either. It's not terribly ugly and I think once the ferns grow up more it will be mostly concealed. Incidentally, having our own compost will yet further complicate throwing stuff out, because now we'll have two categories of compost: backyard compost (fruit and veg scraps, tea and coffee, and yard waste) and city compost (leftovers, meat, kleenex, all that gross stuff). So we'll need two containers on the kitchen counter. There's gotta be a good way to do that but I haven't figured it out yet. I want to create a path between the back gate and garage, and the front gate (which is where the path by the deck leads). Ideally that would be some kind of cool flagstone path, either with rectangular flagstones or crazy paving, but for now we'll have to settle for the leftover Unilock from those same neighbours' previous front path. 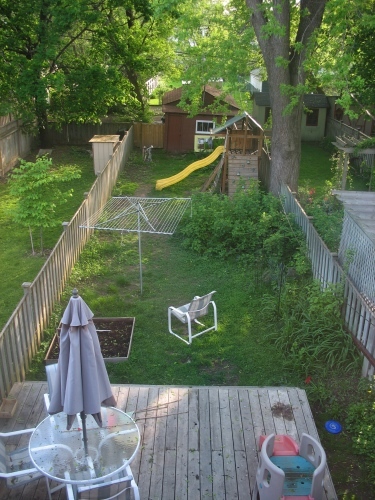 It would also make sense to pave the area around the laundry dryer since I stand around there a lot and lawn doesn't stand a chance. Plus that way if I drop something it won't get all muddy. We've got the vegetable garden going by the deck there, and I expect it will stay there because that's one of the sunniest parts of the yard, unless we give up on it altogether and just grow food in the planters on the deck. For the rest of the garden, I'm going for a low-maintenance, woodland, bird- and butterfly-friendly mainly-native plant vibe. The only specific plants I have in mind at the moment are a Saskatoon berry plant for the birds, and something evergreen for winter interest, of which I have none at the moment. I'm finding it really hard to source native plants but I suspect I just don't know where to look. I need to keep researching them so that I have the names of native plants in my head, so I recognise them when I see them. Most garden centres and catalogues don't have any comment on whether plants are native or not. That's the plan. It's going to take a while to get there, but at least I have some idea where I'm going so I'm no longer paralysed by my garden. Onward!